A picture has emerged of the closely-guarded Game of Thrones film set at Larne’s Sallagh Brae. The picture, captured by Bill Guiller, appears to show a tall, round wooden structure with a pointed roof and small entrance hall. Last week, the Times revealed how privately-owned land just off Sallagh Road was being used to shoot scenes featuring 400 extras for the forthcoming sixth season of the epic fantasy TV show. Bill told the Times: “There weren’t any characters on the set when I went there, they seemed to be clearing it away. Security has been tight for filming of the new series, and last week a Youtube video emerged showing how local snappers were challenged by Game of Thrones security guards during filming at Carnlough Harbour. While star Maisie Williams, who plays Arya Stark, entered the cold waters of the harbour, security guards in blue jackets put their hands over photographers’ cameras in a bid to block their view of the filming. Sallagh Brae and Carnlough Harbour are not the first local sites to be used to film the blockbuster show. 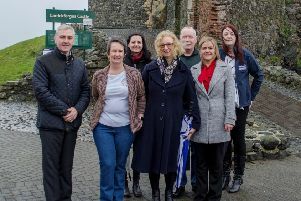 Local councillors recently called for the Game of Thrones TV set to be left at Magheramorne Quarry as a tourist attraction after filming wraps. The site, which is owned by Lafarge Tarmac, doubles as Castle Black, the Wall and the Wildling village of Hardhome in the HBO-produced series.